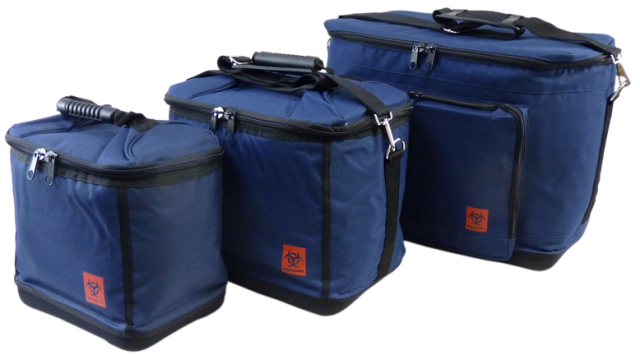 The new Therapak Courier Totes are made with heavy-duty materials and can be used for all three specimen temperatures (frozen, refrigerated, ambient) including dry ice! Each unit is silkscreened with a biohazard logo on the front and comes with a removable inner liner. 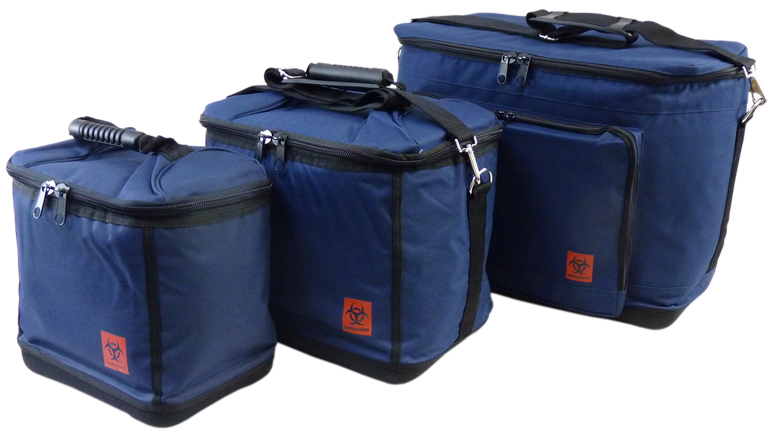 The Large, Small and Extra Small totes have a rigid bottom for maximum durability. These convenient and portable courier totes offer lightweight versatility as well as durability for your specimen transport requirements. Constructed of waterproof, scuff-resistant nylon material, the small courier tote includes a molded urethane insert, while the standard size courier tote uses either EPS foam or a urethane insert. One divider is included to separate temperatures inside. Each courier tote serves to protect the safety and integrity of frozen, refrigerated and room temperature specimens. Customization is available for as few as 24 units and can include a variety of fabric and print colors. For the ultimate preservation of your specimen integrity during transport, the Duramark® Electronic Cooler offers a long list of convenient and beneficial features. With state-of-the-art technology and digital controller, the required temperature can be set and maintained with complete confidence, from refrigerated to frozen (+50°F to 0°F / +10°C to -18°C)*. Units are powered using either 12-volt DC or 110-volt AC power with included cables. Battery saving circuitry protects courier vehicles from premature battery drainage. Virtually silent during operation, it is completely safe to the courier because it does not emit any CO2 gases common with dry ice use. 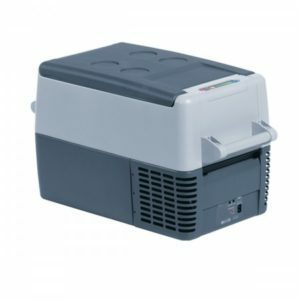 Made of high impact materials, the coolers are constructed to provide years of reliable, trouble-free use. An added benefit of the Duramark® Electronic Cooler is the cost savings by eliminating the need for procuring and handling dry ice. Overall, the Duramark® will provide the courier with a dependable tool for transporting valuable diagnostic specimens with minimal maintenance and maximum confidence. These products provide an ‘active’ solution for the transport of laboratory medical specimens. Using the 12-volt power plug in a vehicle, each unit will cool to approximately 40°F lower than ambient temperature or heat to around 135°F. Optional equipment includes a Battery Saver Switch which protects the car’s battery from premature draining as well as an AC Power Adapter. This adapter allows the unit to be used in any 110/120 volt AC wall outlet. Custom temperature options are available. Ask your Therapak Representative for details. 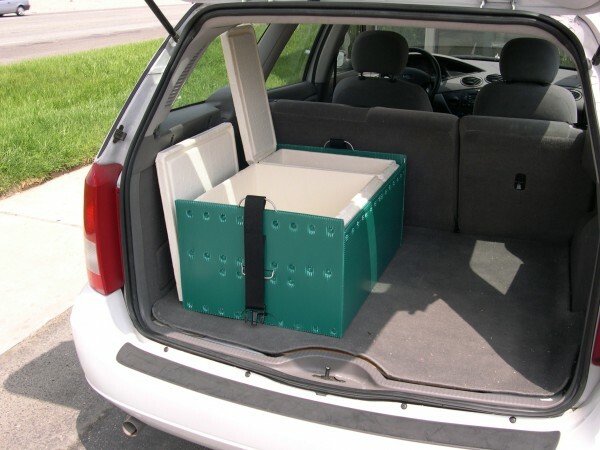 Car Caddies are large capacity containers for specimen transport that fit well in most courier vehicles. Available in five different internal configurations, the Car Caddy provides for multiple temperature possibilities within the same container. Specimens requiring frozen, refrigerated, and ambient temperatures can be easily segregated while maintaining the required temperatures of the individual specimen. In addition to the interlocking foam lids, a nylon mesh belt with a quick-release buckle is utilized across the top to assist in securing the lids. The outer shell is composed of Kelly green 4 mm corrugated plastic, which is both durable and easy to clean. Built-in reinforced metal handles assure safe transport from the vehicle to the testing area. The interior is available in two different materials – EPS foam inserts and urethane inserts. Please see below for optional configurations. Customization, including special material colors and custom printing, is available. Minimum custom order quantity is 25 units.